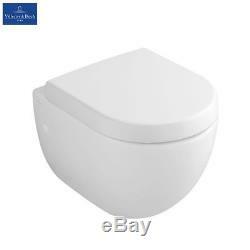 Villeroy & Boch Subway wc wall hung toilet pan + Soft close seat. None sale items can be ordered with trade discounts so please enquire for any V&B or other brand items you may require. 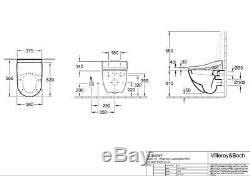 Wall hung &###xA0; Villeroy & Boch Subway &###xA0;wall wc/toilet pan + soft seat. Geberit and Grohe frames available. All listings sell only described items. If stock image is used please be aware that no taps or other additional items are included unless specified. Pan code: 6600.10.01. H for all collections, if other&###xA0;methods required please advise. Collections and couriers are welcome and strongly recommended for oversized or overweight items that we are not able to use nationwide services for. &###x200B;&###x200B;&###x200B;&###x200B;&###x200B;&###x200B;&###x200B;All collection from Pinner HA5 (London), easy access from M25, not far from Heathrow. &###x200B;&###x200B;&###x200B;&###x200B;&###x200B;&###x200B;&##x200B. United Bathrooms part of United Group&###xA0;is a supplier of premium bathroom goods at discounted prices. &###xA0;We only sell UK supplied and genuine branded goods from Villeroy & Boch, Keuco, Hansgrohe, Duravit, Grohe, Geberit etc. &###xA0;All items we list are held in stock but please do not hesitate to ask any questions beforehand. We can supply&###xA0;any German brand any&###xA0;bathroom products to order from current brochures/catalogues so please enquire. &###xA0;Please note that some items listed can be older stock and have dusty or tatty packaging. If packaging is important please enquire before purchasing. United Group cover&###xA0;United Builders, United Joiners, United Floors, United Windows and United Bathroom supply and fitting services within London and surrounding areas. Since we only deal online all collections and viewings are by appointment only in advance. Howerver visit slots have to be planned and adviced&###xA0;quite precise&###xA0;for all visits whatsoever. Any damaged parcels should not&###xA0;be signed for or must be marked as "unchecked" upon signing for&###xA0;and must be reported back to us. Any product you return must be in the same condition you received it and in the original packaging with all labels. None sale items can be ordered with trade discounts so please enquire for any V&B or other brand items you may require. 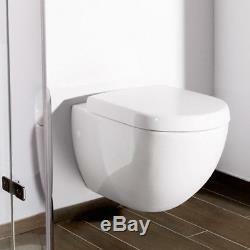 Please enquire: united-bathrooms Wall hung Villeroy & Boch Subway wall wc/toilet pan + soft seat. Geberit and Grohe frames available All listings sell only described items. The item "Villeroy & Boch Subway wc wall hung toilet pan + Soft close seat" is in sale since Monday, March 5, 2018. This item is in the category "Home, Furniture & DIY\Bath\Toilets & Bidets\Toilets". The seller is "ubathrooms" and is located in Pinner, London.